Ontario’s pot plans continue to make news after Finance Minister Vic Fedeli told BNN Bloomberg he blames Ottawa’s handling of the recreational marijuana rollout for the lack of cannabis supply. Fedeli’s comments come on the heels of Ontario’s introduction of new measures to vet retail pot license applicants at the beginning of the process. Cannabis retailers told BNN Bloomberg they still don’t know when the province will allow for more store openings given the lack of transparency regarding Ontario’s pot supply. There’s a new company joining the S&P/TSX 60 and it’s none other than Canopy Growth. 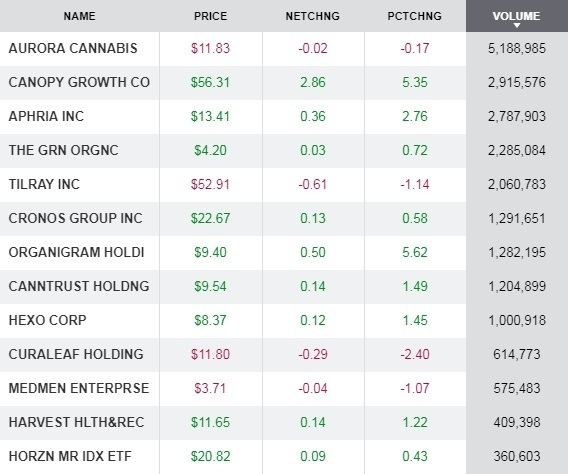 The largest cannabis company in the world is also the first pot firm to be added to the index of Canada's large-cap stocks. Canopy's stock will replace Goldcorp once the company’s merger with Newmont Mining is complete. The change will take effect before trading on April 18. Canopy Growth was first went public on the TSX Venture exchange in 2014, and graduated to the main TSX board in 2016. With older Canadians expected to be a major buying group of legal and medical cannabis here in Canada, CARP is spearheading an educational campaign with Spectrum Cannabis, a wholly-owned subsidiary of Canopy Growth, to inform that demographic about the various benefits and aspects of the drug. The campaign will focus on giving CARP’s 320,00 members more information on medical cannabis and preferred pricing for Spectrum Cannabis-branded products which have already received the "CARP Recommended" seal. Details of the specific educational campaigns were not released. Puerto Rico is quickly becoming the next frontier for medical marijuana as millions of dollars in investments are financing cannabis farms and dispensaries on the island nation, NBC News reports. Puerto Rico legalized medical marijuana by executive order after a series of public debates in 2015 and around 72,000 patients have signed up for the island’s cannabis program. The government has issued 77 dispensary licenses and 40 have opened across the island which is believed to generate $100 million in new tax revenue by 2020 and create 20,000 jobs. However, Puerto Rico also suffers from similar challenges faced in the U.S. and elsewhere in terms of restrictions on banking-related activities and law enforcement tensions. - The price of a gram of cannabis in Canada, according to the Cannabis Benchmark’s Canada Cannabis Spot Index. This equates to US$2,418 per pound at current exchange rates.